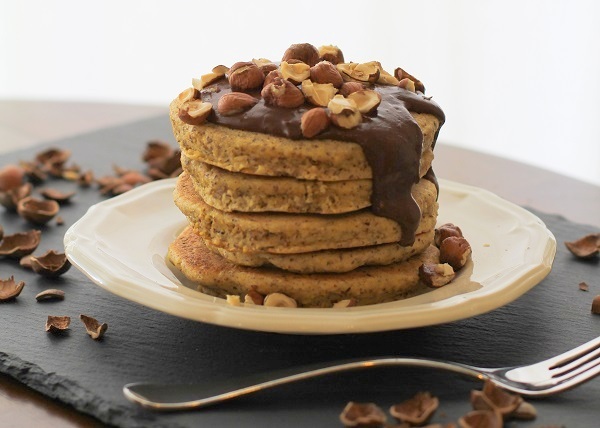 A stack of gluten free hazelnut pancakes with chocolate coconut cream sauce will do your taxes for you. Just kidding, but it tastes mighty fine! This post is sponsored by Bob’s Red Mill, but all opinions are – and will forevermore be – my own. Yooooosemite Sam, have I got breakfast for you?! It’s been a hot minute since I’ve shown you a steamy succulent stack of gluten free pancakes. But it was well worth the hiatus because oh.my.lanta, these things are supercalifragilisticexpialidocious! I’ve made my fair share of gluten free almond flour, coconut flour, brown rice flour, etc., etc., pancakes, but never had I ever made hazelnut pancakes until…just now. I used Bob’s Red Mill’s hazelnut flour and brown rice flour to fashion up this stack. They turn out nutty, fluffy, moist, and insanely addicting. I’m 98% sure no other stack I’ve made can measure up to these hot cakes, and those are strong words considering my undying love for the gf flippity flapjack. Can we just address the elephant in the room here? The chocolate coconut cream elephant? The elephant you’re thinking turns a stack of breakfast pancakes into plate of dessert cakes, but totally doesn’t? It’s a real mind blow. Like an Andy Warhol painting. It will, beyond the shadow of a doubt, jettison you into outer space. The chocolate coconut cream is nothing more than full-fat coconut milk, raw cacao powder, and pure maple syrup. This translates into a naturally sweetened and – I do declare – completely healthful topping for your stack o’ nutrish. Don’t not do this. Do this. In a medium sized pot, add all ingredients for the chocolate topping and bring it to a full boil. Reduce the heat to a gentle boil and cook until thickened and smooth, stirring consistently, about 25 to 30 minutes. In a mixing bowl, combine the hazelnut meal, brown rice flour, salt, cinnamon, and stir together well. In a separate bowl, whisk together the eggs, maple syrup, and coconut milk. Pour the dry mixture in with the wet and mix until combined. Allow the batter to sit 5 to 10 minutes. Heat a large skillet or griddle to medium heat and add just enough oil to lightly coat the surface. Measure out a heaping 1/8 cup of pancake batter and pour it on the hot skillet. You will likely need to spread the batter into a circle shape using a spatula or fork. Allow pancake to cook on the first side about 2 to 3 minutes, until the sides set up. Flip and cook another couple of minutes until cooked through. 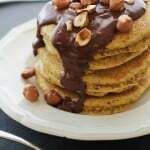 Serve pancakes with desired amount of chocolate topping and hazelnuts. Pancakes!! The thing that will solve the world’s problems. Bring me a stack, ok?? The end. I don’t know…who can be grumpy while eating a stack of hotcakes? Especially with the topping? Couldn’t get any worse…..But, yes. Definitely while doing taxes. Oh my lord! Hazelnut is one of my favorite things ever. Trying these this weekend. They look amazing! Thanks! Oh wow. 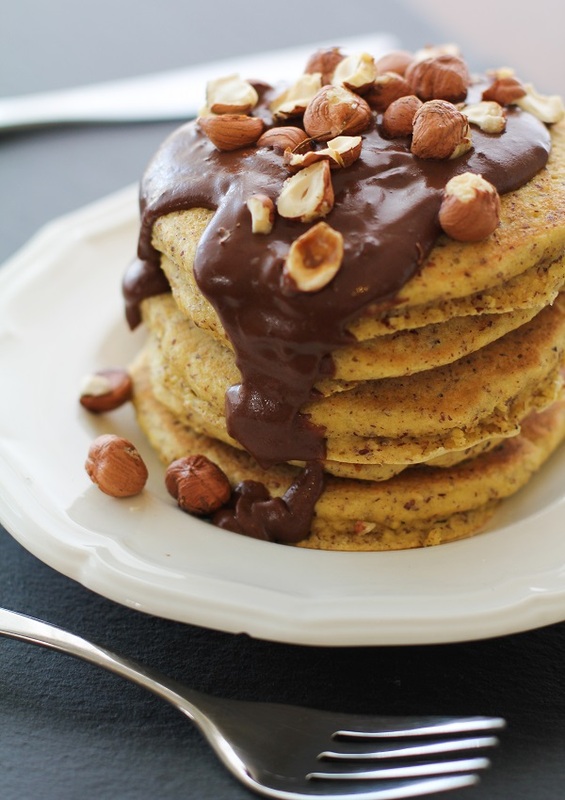 Hazelnut pancakes with chocola…oh sorry, my mouth is so full of drool that I can’t finish the sentence. They look like dessert!! I definitely won’t not make these. Oh my gosh, look at that sauce!! That silky rich texture looks unbelievable! What an incredible pancake flavor. I have to make these soon!!! omgyesyouwilllovetheeeeeeeeeeeese! #amazing. No seriously, these are right up your alley, being as it is that the whole shabangarooski is allll naturally sweetened! 🙂 MM!! Well, I only want to go to the outer space that involves THESE pancakes and THAT cream. Because any other kind of outer space just won’t be as awesome. I have a love affair with pancakes, and these look divine. Thanks for sharing it with us. These sound fantastic! 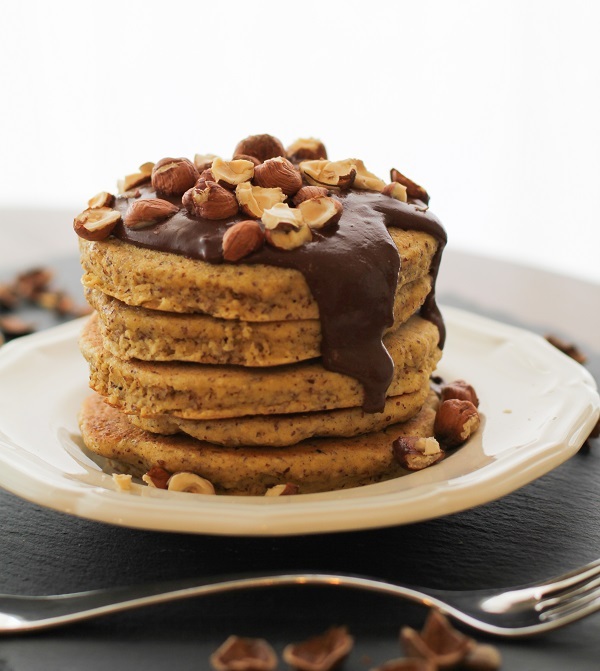 I’m intrigued by nut flours, need to try your pancakes! Oh my these look GOOD!!! Definitely giving these ones a try! Omg, omg, omg!! Amazing!! These need to happen as soon as poosible. Chocolate and pancakes are one thing, but chocolate coconut cream!! So excited! If they would do my taxes I would eat pancakes every day. Better do so anyway just to make sure. These look awesome. I have coconut flour, not brown rice flour? How much extra liquid do you think that I would need if using CF? thanks! Ohhhh coconut flour sounds yummy!! If you’re adding 1/2 cup of coconut flour, I’d start by adding 1 more cup of coconut or almond milk. If the batter turns out too thick, I’d add a few tablespoons at a time until it got thinner/creamier. 🙂 Let me know how they turn out!! These look wonderfully dense. and i <3 chocolate breakfasts. Thanks so much, Jenni! I’m glad you like the pancakes and I appreciate you including them in your roundup! Have a great weekend! Ooh yum! I made a peanut butter coconut cream the other day for my coconut pancakes but chocolate cream would be just as decadent, and compliment the hazelnut awesomely! These look amazing! Love the hazelnut meal! It makes everything so much better! Oh I could eat a stack of those right now, they look delicious! Can I have more chocolate please! I al glad I found your site, love your recipes and pictures too! check out my Hot Fudge Cake post today! I’ve looked at the local grocery store and the food coop and haven’t seen anything called hazelnut meal. is this something you purchased or did you grind it yourself in a food processor? These keep calling my name and want to try them soon! Thank you! WHOA had no idea hazelnut meal existed… have to buy some ASAP! these sound delicious, thanks for posing up this.. This looks amazing!!! I can’t eat egg – what should I substitute? The chocolate coconut cream sounds divine, but I can’t imagine spending so much time making it… I get fatigued/distracted too easily. Is there a quick version that has a similar enough outcome? Thanks, Ashlee! You can make a gelatin, chia, or flax egg, but as a heads up, the pancakes may turn out a bit flatter than usual. Hope you enjoy! Oh my days. These look like legendary, never to forget, always to make again, to die for pancakes! Been thinking to make almond flour pancakes but realised I have all the other nuts in my pantry except almonds! Was researching pistachio first as I have a big bag of those..but I need to shell them, first thing in the morning and green pancakes may or may not put off my hubby or my toddler! But hazelnut!! Oooh! Do you know if they would work with only hazelnut flour, no rice flour? Need to stock me up on these speciality flours I think. Hoping these will work tomorrow! The flavor is fantastic, but I really struggled with the pancakes not holding together as I flipped them. It basically turned into pancake crumble smothered in chocolate sauce. Tasted great though. Any idea what went wrong?